Russia has announced a package of economic sanctions against Turkey over the shooting down of a Russian jet on the Syrian border on Tuesday. A decree signed by President Vladimir Putin (in Russian) covers imports from Turkey, the work of Turkish companies in Russia and any Turkish nationals working for Russian companies. The decree also calls for an end to charter flights between the countries. Turkish President Recep Tayyip Erdogan has refused to apologise to Russia. On Friday, he accused Moscow of "playing with fire" in its Syria operations. But on Saturday, he said he was "saddened" by the downing of the jet. Turkey and Russia have important economic links. Russia is Turkey's second-largest trading partner, while more than three million Russian tourists visited Turkey last year. Mr Putin's spokesman Dmitry Peskov said on Saturday that there were close to 90,000 Turkish nationals working in Russia. Taking family members into account, that figure rises to 200,000, he said. The decree also urges Russian tour operators to refrain from selling packages to Turkey, while Turkey's Foreign Ministry has warned its citizens against non-essential travel to Russia "until the situation becomes clear". What future for Turkey-Russia relations? In fact, shoppers have already been affected. Earlier this week, Russia's agriculture minister said that around 15% of Turkish produce did not meet Russian safety standards. Some imports were blocked, and trucks stranded at borders. The new sanctions will mean some imports will be stopped - but it is not yet clear which. Turkey has exported food and agricultural produce worth over €1bn (£702m) to Russia already this year, and Russia says 20% of its vegetable imports come from Turkey. Turkey's Anadolu Agency says exports of leather, textiles and clothes to Russia were worth more than $1.52bn (£1bn) last year. On Friday Russia suspended its visa-free arrangement with Turkey. 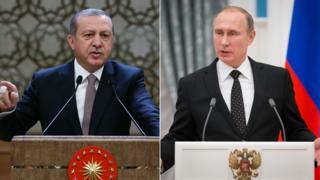 Mr Erdogan has asked for a meeting with Mr Putin, who wants an apology from Turkey before he will agree to talks. Turkey says the Russian plane had intruded into its airspace and ignored warnings to leave. But Moscow maintains that its SU-24 fighter jet was downed by a missile fired from a Turkish jet inside Syria. Mr Putin has also firmly rejected any suggestion Turkey did not recognise the plane as Russian. He said it was easily identifiable and its co-ordinates had been passed on to Turkey's ally, the US. Russia has sent troops and aircraft to Syria to back up the Syrian government of Bashar al-Assad in the civil war. Turkey, which is a member of Nato and of a US-led coalition in the region, insists Mr Assad must step down before any political solution to the Syrian conflict is found. Both countries say they are trying to rid the region of the so-called Islamic State (IS) group, which claimed the recent attacks on Paris, Ankara and also on a Russian airliner. On Saturday, the Turkish president again defended the shooting down of the jet and criticised Russia's operations in Syria in support of President Bashar al-Assad, whom Ankara opposes. But he renewed his call for a meeting with Mr Putin on the sidelines of the Paris Climate talks next week, saying that both sides should approach the issue more positively.